1 Setting up your encoder. 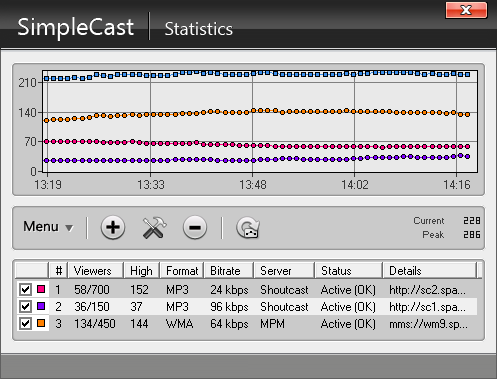 Click on the "Statistics" button on the main SimpleCast window. Once the "Statistic Relays" window opens, click on the "+" button to add a new statistic relay. You should see a list of statistic relays to choose from. Select "MediaPoint Manager (Windows Media)." The circle next to it should be checked. Then click "OK."
2 Adding a SHOUTcast Encoder to SimpleCast. The MPM Host is your Primcast Windows Media Stream Address. 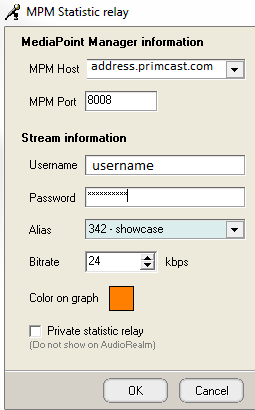 The MPM port must always remain 8008, after which you need to type in your username and password. Once you've entered all your information, you can either wait for the graph to update itself or right click on "Stat relay", and click on "Force Update"